Most countries lack sufficient IT security professionals to protect their IT infrastructure. To help mitigate this problem, many of them setup national cyber security competitions for finding young cyber talents and for encouraging them to pursue a career in cyber security. to determine which country has the best cyber talents. 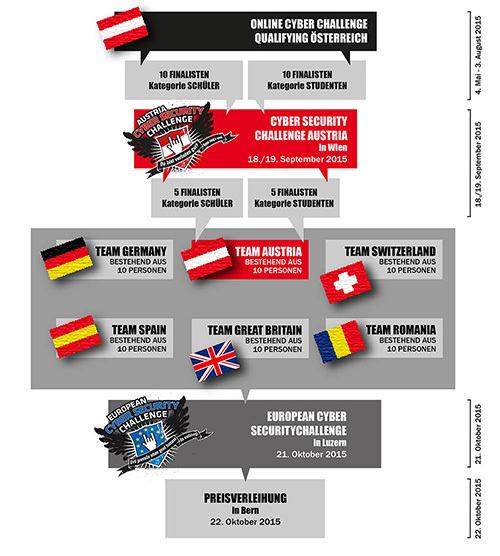 To find out who’s countries team is the best, contestants have to solve security related tasks from domains such as web security, mobile security, crypto puzzles, reverse engineering and forensics and collect points for solving them. Rafael Tesoro-Carretero- EC DG CONNECT. Austria, Germany, Switzerland, Romania, Spain and United Kingdom. Teams consist of two (max. 3) coaches/staff members and a maximum of ten (10) contestants from two categories: Junior and Senior. The senior category might not contain more than five (5) members.